IF YOU’RE JUST TUNING IN, please start on PART 1 HERE. When you see a “+” next to any specific day in the book, it indicates an ongoing marketing activity, one that you’ll need to perform repeatedly while you continue to promote your book. 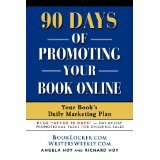 Please refer to the chapter titled “AFTER 90 DAYS: YOUR BOOK’S DAILY MARKETING PLAN” for a recommend schedule of these ongoing marketing activities. If you already had your own website when you bought this book, you may have skipped to this chapter. Although you probably already have content on your website, please read this chapter because it contains advice all authors should follow. In the online world, “content” refers to the material you put on your website to attract visitors. Websites that have regular readers have two features in common. First, the content is unique. Second, the content is updated regularly. Both features make sense. Why would anyone visit a site that has basically the same content as any other site? And, why would they visit more than once if the content never changes (excluding, of course, sites that are reference material)? Some of you may have one or more books on the same topic and others may have books on multiple topics. For the latter, you can create different sections on your website for each topic. For this exercise, we’re going to assume you are creating new pages on your website that will promote one of your books. 1. Who is my target audience? 2. What makes my book unique? Let’s say your book has specific chapters on using unusual species to create bonsai trees, like maple trees or lemon trees. It’s those chapters that make your book different from other bonsai tree books on the market, and that answers question number two. You can use these two insights as the basis for the content of your website. We should take a step back here and point out that search engines (the primary way people find new websites) love unique content. That’s why it’s so important. Therefore, the object here is to figure out what content you can put up that will make your site stand out from the rest in the search engines, yet still attract enough readers to make your efforts worthwhile. Remember, niche is better. So instead of writing about “bonsai tree care” write about “olive bonsai trees,” or some other niche in the bonsai category. There may be fewer people searching on that term, but that also means there is less competition from other websites, increasing the chances that your article will be found first. Plus, recall that we identified above the niche that makes the book in our example unique—it has chapters on using unusual species to create bonsai trees—so other phrases from the list like “bonsai grape tree,” “bonsai orange tree,” and “lemon bonsai tree” would also make great content for your site. You can also enter the phrase “Keyword Research Tool” in your favorite search engine to come up with other services and options for performing this research. NOTE: See Day 12 for a more in-depth discussion on keywords. Using the instructions above, develop a keyword or phrase list around which you can write unique articles for your website. _____ Using one of the keywords / phrases from your search yesterday, write a unique article, edit it, and publish it on your website. + This is an ongoing activity. Please refer to “AFTER 90 DAYS: YOUR BOOK’S DAILY MARKETING PLAN” near the end of this book. IMPORTANT: You should load your website early with at least five unique articles. Try to write and edit at least one per day this week. You should aim to add a new article to your site once per week thereafter. The more unique content you feature, the more popular your website will be (and the more books you’ll sell). Unique content also makes your website more attractive to search engines. You MUST Reach Out to Readers. Do NOT Wait for Them to Remember You Exist! I’ve always said that the best way to sell a book online is to publish an ezine. Why pay someone to advertise repeatedly in their publication when you can create your own? Offer quality editorial on a regular basis (weekly, bi-weekly, monthly—the more frequent, the better), and reach out to your readers via an ezine. Should you blog instead? Sure, but only if you email your readers each time you post an update. Blogs use special software that makes adding and updating content extremely easy, but you can use that software to publish your ezine as well. If you create a typical blog, you’ll have to wait for people to come back to visit you (but only after they remember you exist) or you’ll have to hope they have an RSS feed (most people don’t). It’s never a good idea to try to convince people to start using new software just to read your material. The easier you make it for them, the more subscribers you will get. Pretty much everybody has an email address so sending out an ezine once a week or so via email will reach far more people than blog updates that aren’t announced by email…or anywhere at all. If you publish an ezine or a blog, you can collect your potential readers’ email addresses (with their permission, of course), and connect with them on your schedule (again, only if they’ve agreed to receive emails from you). You don’t have to wait for them to remember to come back to visit because you’re reminding them about your ezine, your website and, most importantly, your book(s) on a regular basis via email. 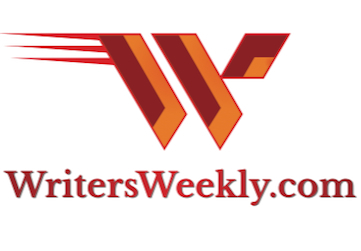 At WritersWeekly.com, we use a blog format to publish our ezine along with an abbreviated email issue that drives traffic (our subscribers) to the website each week. The email issue features teasers that direct readers to our website for the full articles. So we get the ease of posting and publishing on the website’s blog format along with the ongoing readership of an ezine. If you choose to publish a blog, much of the information in this chapter will apply to you anyway, so keep reading. If your book is non-fiction, you can easily create quality, free editorial content on a regular basis. If your book is fiction, you get to have lots of creative fun. Most of my books are written for writers. Our online publication, WritersWeekly.com, is an example of a successful ezine that uses blogging software (WordPress). We give away free editorial each week in the form of an email featuring links to the current website issue, which includes paying jobs for freelance writers and editors, paying magazine market listings for writers, feature articles, freelance success stories, whispers and warnings about unscrupulous editors and publishers, and more. At the same time we are informing and entertaining our readers, we are also promoting my writing-related books, writing-related books by other authors, and our successful publishing company, BookLocker.com. Years ago, WritersWeekly (under a different name) was distributed monthly. When we switched from monthly to weekly, our sales quadrupled. I still kick myself for waiting so long to figure that out! First, the obvious. Name your ezine. Take your time on this step. The name of your ezine is as important as the name of your website and the titles of your books. Our ezine has the same name as our website. Next, don’t waste time reinventing the wheel. Research competitors (and others), and emulate how they format their ezine issues, both online and via email. Text ezines are still popular but many people create HTML issues now. Create different sections for your first issue. Two or three are fine to start. You can always change, add, or delete later, according to your readers’ comments and requests. Create a generic, sample issue to send out to new subscribers in the interim. People love instant gratification! Once you’ve created a sample issue, you are ready to start collecting the email addresses of your potential fans. When I first launched WritersWeekly, I kept my list of subscribers in a simple spreadsheet, and used my email program’s blind carbon copy (BCC) option when sending out each weekly issue. Later, it got too big and we had to switch to a professional list and mailing service. You can start soliciting email addresses on your website via a form, or you can simply ask website visitors to email you. A form is preferred, however, because spam filters are making doing business by email increasingly ineffective and frustrating. Most large Internet Service Providers (ISPs) use hard filtering to kill suspicious emails even before they arrive in the recipient’s own spam folder. You don’t have to do anything naughty to get blacklisted. Your email can be hard filtered simply based on a word appearing in it, or the ISP you use, or even because some spammer used your email address at one time to send out junk. Many companies and individuals have lost business due to undelivered emails. Some authors don’t have the technological know-how to create web forms. Per the previous chapter, WordPress can help to a certain extent. If you’ve opted for a professional website that is hosted by a web design firm, they can absolutely help. Please see the end of the first chapter of this book for a list of recommended web design services. You can also find a freelance web designer through your favorite search engine, or through Craigslist.org if you’re really in a bind. Just remember to not give anyone else complete control over your website! We’ve heard horror stories over the years about disgruntled web designers taking websites hostage, deleting content, and even shutting them down. One woman we know had her boyfriend set up her website. He did it under his own name and, when they broke up a years later, he took her website with him. She lost everything, including several years worth of original articles. Never let anyone else have complete control over YOUR intellectual property. One way to entice readers to subscribe is to offer something free. 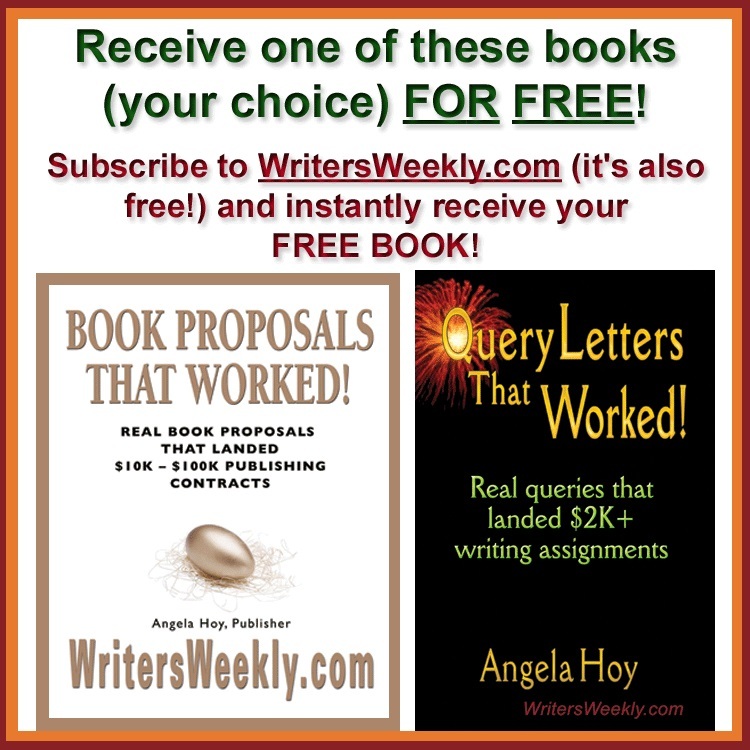 I offer a free ebook to new subscribers at WritersWeekly.com: How to Be a Freelance Writer. This has been very effective over the years. If you’re a fiction author, you can offer a long article as a free ebook or perhaps something readers don’t get in your book (maybe copies of letters written by the main characters, or pages from the main character’s diary?). Get creative. You can think of something your readers might be interested in getting as a bonus for subscribing. One thing is certain: if you don’t offer a free bonus to potential new subscribers, you’re going to have a very hard time building a good subscriber list. People don’t like to give out their email address unless they have a very good reason to do so. A free product, even if it’s electronic, is a great temptation. When someone subscribes, send them the current issue of your ezine, and add them to your list of subscribers so they’ll receive future issues. Whenever somebody unsubscribes from your publication, immediately remove their email address from your list. Spam can ruin a reputation. As I wrote above, I initially kept our subscribers in a spreadsheet, and used my mail program’s BCC function to send out each issue. We now have it entirely automated. Once your list grows a bit, and if you feel you need mailing list software ideas, type “mailing list software” or “email list software” into your favorite search engine. Don’t stop at creating email issues. You need to post the content from each new issue to your website as well. Because this is new content, it makes your website more attractive to search engines and, the bigger your website, the more material you have that people on search engines might be looking for. In addition, readers who don’t get your email issue because of spam filters can go to your website each week if they want to see the current issue. 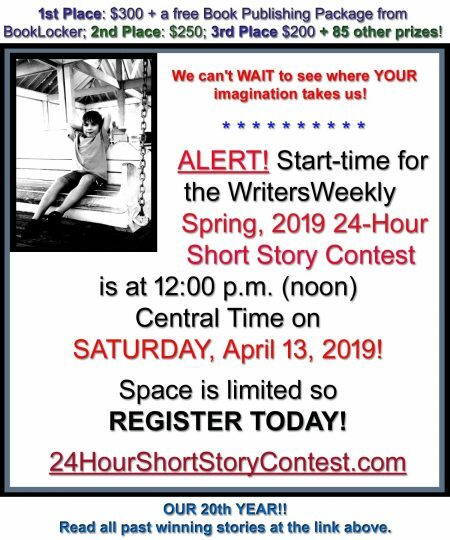 To see how we do it, go to WritersWeekly.com and click around a bit. You can see the teasers, and click on those for the actual articles. And for heaven’s sake, start promoting your ezine and free ebook via your email signature! Most email programs have an automated signature option. See Days 21–23 for more information. Post your first issue on your website, format it for email delivery (refer to the WritersWeekly example for help), and make it available to email to new subscribers immediately on request, either manually or via an automated system. Create a free ebook or other informational/entertaining product to give away to new subscribers. Create a way for people to submit their email addresses to you, and for you to manage those email addresses (either manually by email, or via an automated web form on your website), and put that information on your website. This may tie in to your mailing list software if you choose to purchase or download that. Research and create a way to manage your subscribers and distribute the email issues at the same time. Again, when I first began, I kept a simple spreadsheet of my subscribers. It was easy and free. Post a large ad on your homepage inviting people to subscribe to your ezine or newsletter, and to receive your free ebook or other free product. Add a blurb about your newsletter (and the free goodie) to your email signature, and also to the signature you use when posting to websites, discussion groups, mailing lists, or blogs online. Be subtle so you aren’t accused of spamming. More about responsible online posting appears in future chapters. Make a schedule. Plan to distribute a new issue by email and post it to your website on a regular basis (the more frequent, the better). 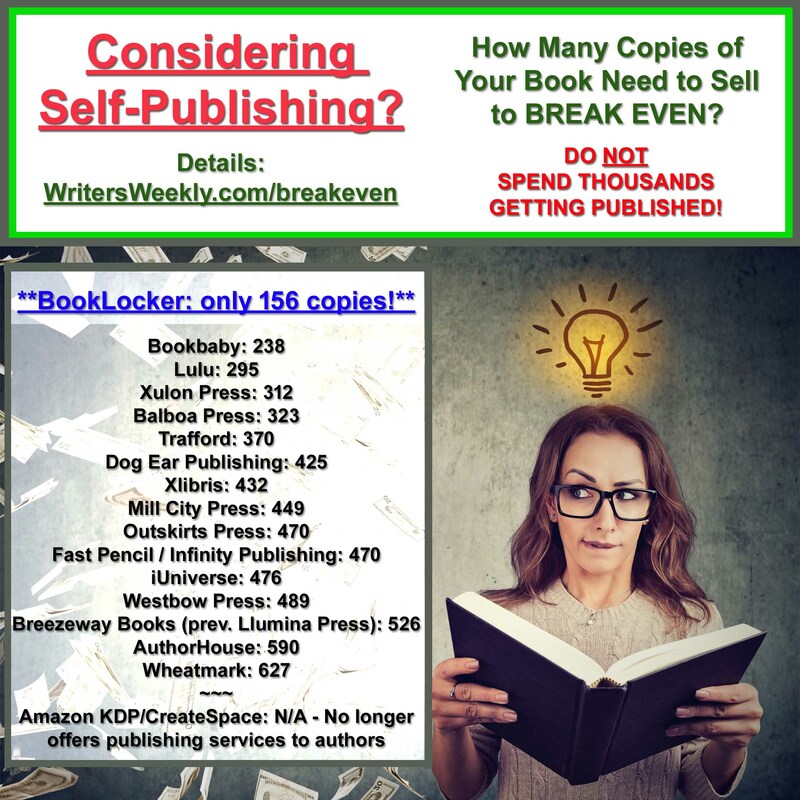 Create plenty of ads promoting your book(s) for your ezine and website, and start adding those on a periodic basis, trying each one on a different week to see which one(s) generate more subscribers and, thus, sell more books. Whatever you do, never ever add someone to your email subscriber list who hasn’t specifically requested it. If you do, you will be reported as a spammer, get flamed to kingdom come, and your reputation will be tarnished if not destroyed. You could even lose your website or email address. NEXT TIME: Finding the Keywords Your Potential Readers Are Really Using Online AND Your Book Marketing Cheat Sheet! More WritersWeekly Articles About Book Marketing! Marketing to Bookstores – Still a Waste of Time? Do NOT Sneak Your Self-Published Book Onto Bookstore Shelves! 2 Responses to "BOOK MARKETING ESERIAL PART 3 – Days 1 – 11: Unique Website Content + Why an Ezine is a MUST for Repeat Traffic and More Book Sales"
Great summary, Richard! Well put. We’re doing the same things with our free weekly PitchTravelWrite.com newsletter, and our business has picked up tremendously. Just wish we started our e-zine a few years earlier too! Thank you so much for sharing this excellent information. Cheers!